As we make improvements to Power BI service, we'll release some new functionality as preview features. Preview features can be turned on and off, giving you the opportunity to try them out. Preview features are also available for Power BI Desktop, for more information visit the Power BI Desktop community forum. 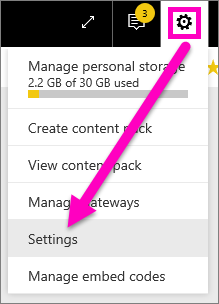 Open your Settings menu by selecting the gear icon in the top right corner of your Power BI screen and choosing Settings. Select the General tab. If previews exist, you'll either see an option for Preview features or you'll see a preview feature listed on the left. In this example, there is a preview listed for ArcGIS Maps. Select the On radio button, or mark the checkbox, to try out the new experience. Then select Apply. To turn preview features off, follow steps 1-3 above, and in step 3, choose Off, or remove the checkmark, and select Apply. Have questions or feedback? Visit the Power BI community forum.